Children Policy: This rate plan is not applicable to children. Prepayment: Full prepayment is required to confirm your reservation. This is nonrefundable. No-show: Your 100% prepayment will be forfeited if you do not arrive within 24 hours of the check-in date and time of the hotel. Connecting Room: Connecting Rooms are available only for Studio Deluxe and Family Suite upon request, and is subject to room availability. Durian Policy: Durian fruits are strictly forbidden in the hotel. 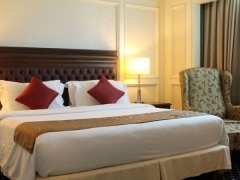 Extra Bed: Extra bed without breakfast MYR 100.00. Extra bed with 1 breakfast MYR 120.00. Superior Queen, Deluxe Queen and Club Studio Rooms are unable to accomodate extra bed due to space limitation. Non-Smoking Room: Non-smoking room can be provided upon request, and is subject to room availability. Pets Policy: Pets are not allowed in the hotel. Smoking Floor: Deluxe Queen and Club Studio Rooms are located on the smoking floors. Tourism Tax Policy: Rates quoted does not include the Tourism Tax of MYR 10.00 nett per room, per night for all foreign guests. Collection of tax took effect on September 1, 2017, and is paid separately upon check-out. Check out The Royale Chulan The Curve for more details about this offer and to book your accommodation now!